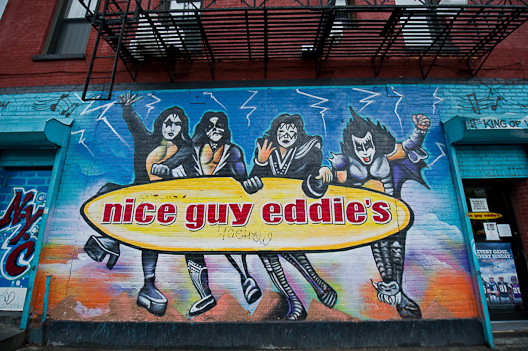 The two things Nice Guy Eddie's has got going for it are its primo location—at the corner of Avenue A and E. 1st Street, East Village and LES night trollers can't help but pass it by—and its name. Nice Guy Eddie was the name of one of Quentin Tarantino's "Reservoir Dogs," and you'll find posters and photos of the movie back near the bar's bathroom, as well as the soundtrack on the jukebox. 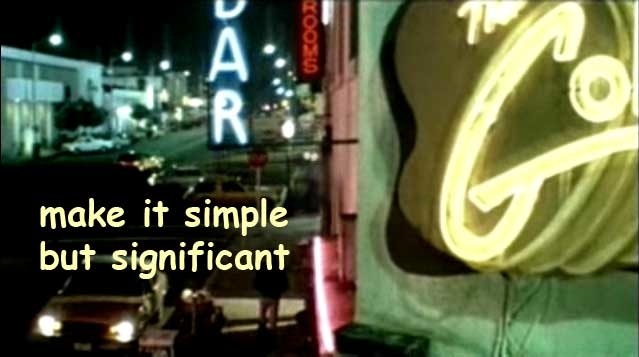 It's a great name for a bar, even if it has taken on a slightly morbid hue—at least for me—since the 2006 death of Christopher Penn, the actor who played Nice Guy Eddie. He was 40. Inside, the scene is free of East Village attitude. It's a big, boxy space, with plenty of mismatched tables, ripped-up chairs and neon beer signs, and a pool table in back. It's not a dive; it's just not taken care of that well. 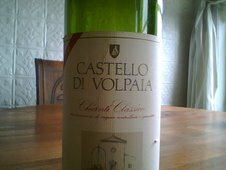 (Give it ten years and, with no upkeep, it may graduate to dive bar status.) The stools along the long bar are filled by twenty- and thirtysomething men, intently watching some football game. This is as it should be, for this is a sports bar, without a doubt. The fans were momentarily distracted from the action when Etta James' "At Last" soared out of the jukebox, and one of the two female bartenders wrapped her arms around the other and began to sway. The taller of the bartenders, in a black and white striped sailors shirt, had the unmistakable bounce of someone new at her job, and new in town. Sure enough, she'd just moved from L.A. two months before. She lamented, with a big smile, that her shift would take her to 4 AM. "What's Avenue A like at 4 AM?" some one asked. "I don't know," she said. "I'm going to find out." David McWater and Steve Zolotow, the proprietors, also own the The Library a couple doors up the street, which is kind of like the same bar, only smaller, and with books; and the Old-West-themed Doc Holliday's, at Avenue A and 9th. They're an interesting pair. Zolotow is a professional poker player known as "The Bald Eagle" who lives in Las Vegas, and McWater's a local mogul of sorts, heavily involved in area politics. It's apparent that each tavern was designed to have a distinctive "personality." But, strangely enough, they all have a vaguely similar vibe—a patina of individuality fronting what is, once you pass through the door, just a basic, almost un-New-York bar.